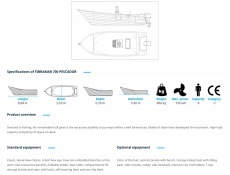 The Fibramar produces their boats in glass-fiber reinforced plastic (GFRP). Contrary to the trend of automation, building is effected manually since the rolling up to the finishing details. This way we proceed to the development of the various phases of production with special care. The attention that is given at each step allows since the beginning of the construction we can make the customizations that meet the individual needs of each client. The efffort of the technical team with decades of experience has led to associate the brand Fibramar a reputation for robustness and reliability. These professionals are continually seeking ways to improve the products and improve manufacturing processes in order to maximize the results. All materials used satisfy a high standard of quality. The Fibramar’s models have CE certificate, respecting the requirements of stability and buoyancy of the Directive 94/25/EC. Currently we don’t use wood or plywood on the structure of the boats. These factors are the commitment of the highest quality and have guaranteed a growing success of Fibramar, especially in the international markets. 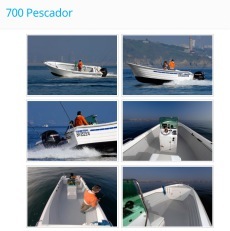 The classic and elegant lines combine with a high performance, stability and security in order to create an ideal boat for recreation, fishing and other water activities.